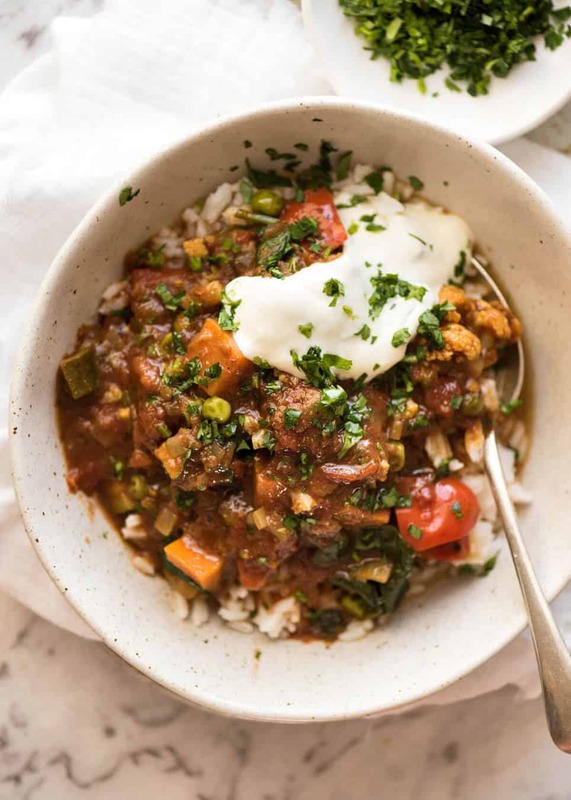 A mixed Vegetable Curry that packs a flavour punch, is loaded with veggies and made with common spices that you might even already have in your pantry! Based on a Caribbean curry, this tastes very similar to Indian curries. Make this as spicy as you want! I slept 11 hours in economy class on the 14 hour flight from San Francisco to Sydney. I can hardly believe it myself. And – touch wood – the trip home was completely uneventful. No arriving home to a collapsing roof and water pouring through the ceiling, no putting petrol into my diesel car, no flat battery, the power was on so nothing was spoiled in my fridge or freezer. Maybe my Post Holiday Curse is broken! The Curse may be broken, but that doesn’t mean that I’ve been touched by a miracle. Specifically – I stepped on the scales, said a little prayer, looked down and pouted. I really had high hopes that all that walking around for sight seeing burned more calories than I consumed. I know, I know. It was wishful thinking. Even when I am hit with bouts of food poisoning (which pretty much happens on every trip where I “eat on the streets”), at best the needle stays constant. But cheers to uber tasty food that just happens to be healthy. Hello Vegetable Curry! 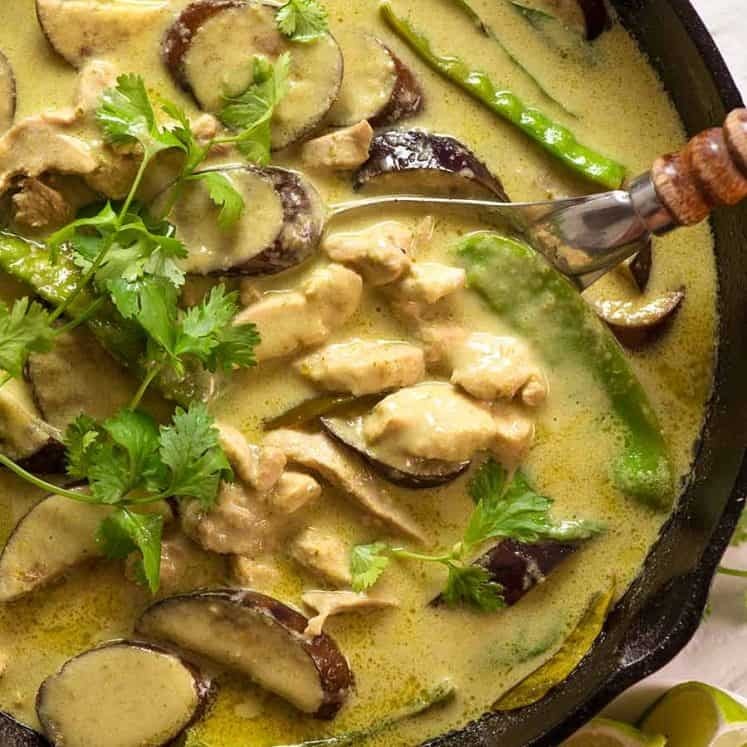 Curries have a reputation for being difficult to make, unless you have a helping hand from a jar of curry paste. Quite often, curries call for spices that are difficult to find in mainstream supermarkets. 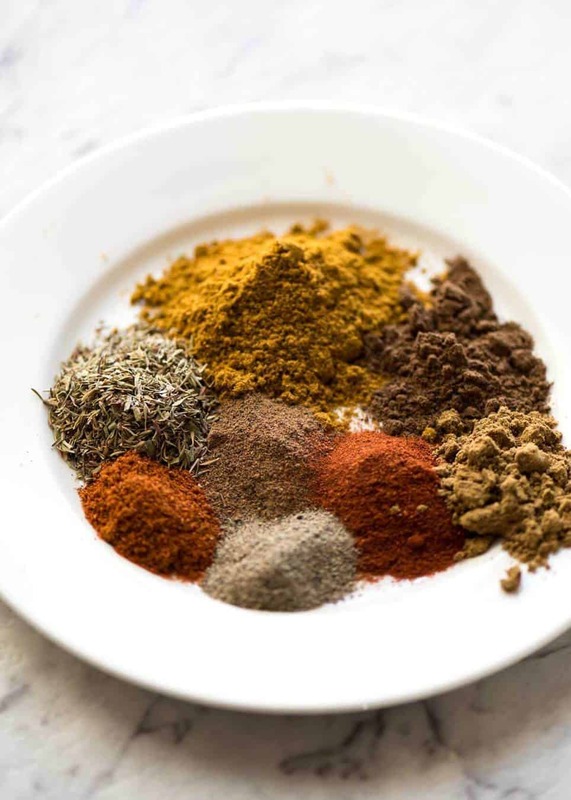 Unfortunately here in Australia, Indian grocery stores are not as common as Asian stores so it can be an effort to find one to locate more difficult to find spices – like Fenugreek, Asafoetida, even black mustard seeds. So whenever I find (proper) curry recipes made with spices that are sold at my local supermarkets, I jump on them. And the spice mix for this one is probably the one I make the most, based on this Chickpea and Potato Curry (Chana Aloo Curry) which I shared a couple of years ago. It’s a Caribbean curry from Trinidad, but it tastes very similar to Indian curries. If I didn’t know it was Caribbean, I would think it was an Indian one – at least, by taste. The original recipe I used is slightly modified from the Curry Channa and Aloo recipe from Immaculate Bites, a fantastic African/Caribbean food site. 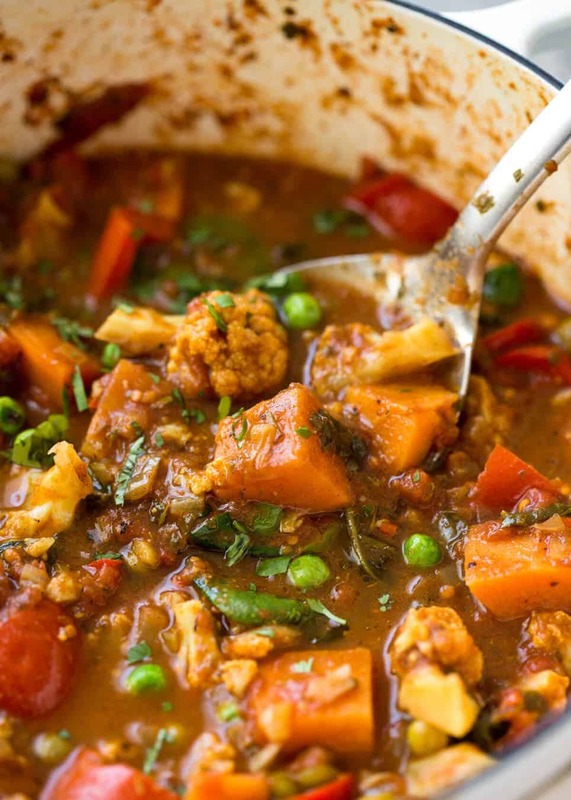 This Vegetable Curry is also based on that recipe. Yes, this recipe calls for a lot of spices – you’ll see in the video that it looks like a lot. And it is a lot – but curries do call for a lot of spices. And the sauce for this Vegetable Curry packs a punch! Adjust the spiciness of this curry by using a mild or hot curry powder, and adjust the amount of cayenne pepper and fresh chilli. 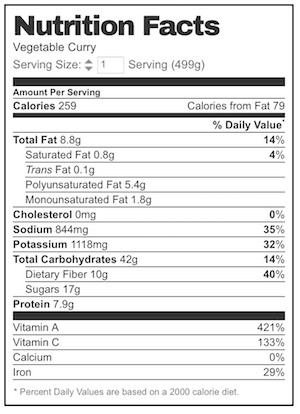 These are the variables that affect the spiciness of this curry. 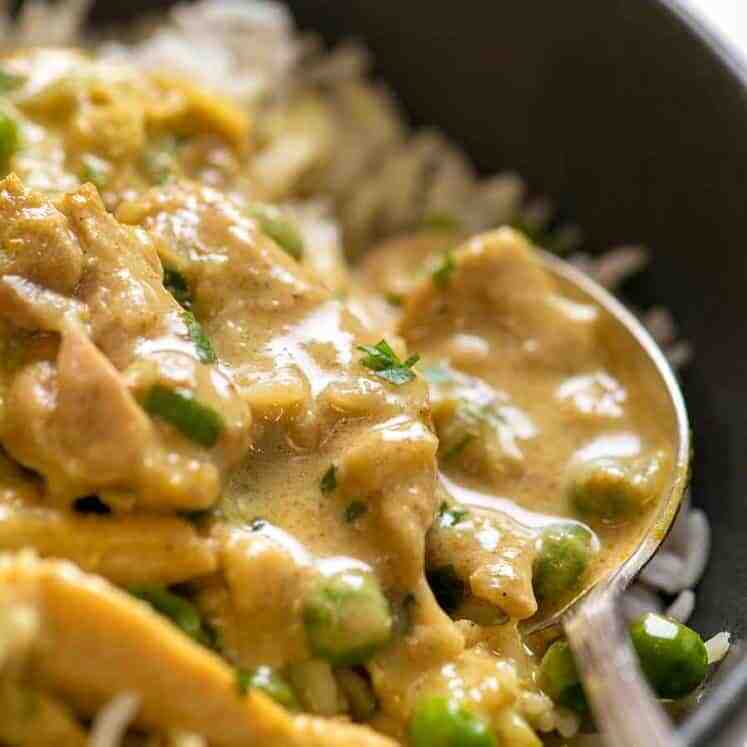 Even if you used mild curry powder and left out the cayenne pepper and fresh chilli, there is still loads of flavour in this curry. 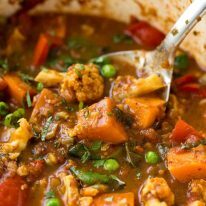 This is a Mixed Vegetable curry, and the recipe is more about the sauce than the vegetables you use. In fact, I used slightly different vegetables in the photos vs the video. 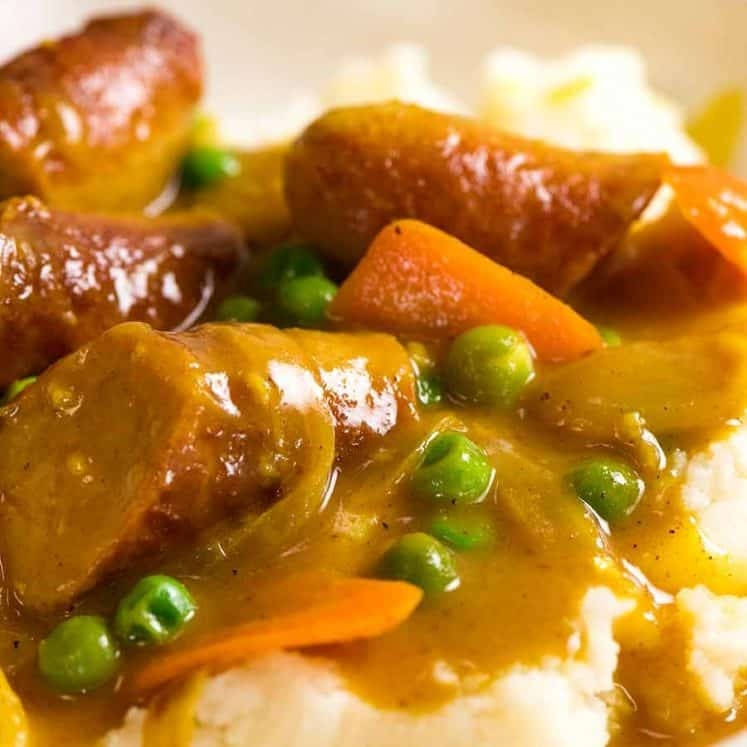 Just follow the recipe quantities by volume for the vegetables and substitute with what you want. This packs a serious flavour punch and is loaded with vegetables! I used plenty of variety, but feel free to use less. Just substitute based on volume rather than weight (because vegetable weight/density differs), and adjust the chilli and cayenne pepper to control spiciness, as well as using either mild or hot curry powder. Heat oil in a large pot over medium high heat. Add garlic and onion, cook for 2 minutes. Add cayenne and cook until onion is translucent. Add Spice Mix and cook, stirring constantly, for 1 - 2 minutes until the spice is fragrant and wet. If too dry, add a tiny touch of water or oil. Add capsicum and zucchini, cook for 1 minute. Add tomato, broth, potato and cauliflower. Mix well, bring to simmer, cover, lower heat to medium. Simmer for 15 minutes or until potato is pretty soft, then remove lid and simmer for another 10 minutes+ until sauce is slightly thickened and potato is soft. Add peas, stir, cook for 2 minutes. Add coriander and spinach, stir until wilted. Season to taste until salt and pepper. Serve over rice. Garnish with yoghurt and more coriander. * These vegetables can be substituted with any vegetables or choice. Measure by cup volume rather than weight. It is 7 - 8 cups in total. Once cooked, it shrinks. 1. 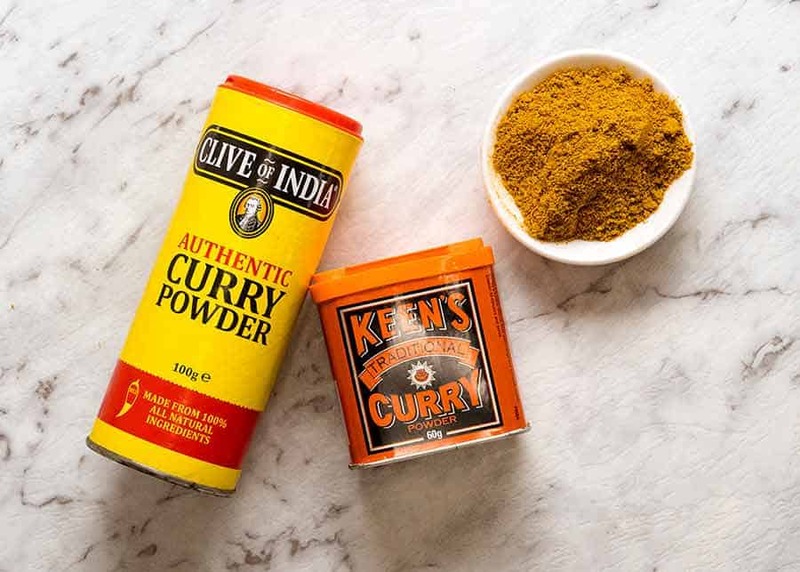 I use Clives of Indian Curry Powder (sold at Woolworths and Coles in Australia). Any curry powder will be suitable for this recipe. Mild or hot - up to you! 2. I add this to cram even more veggies into this curry. It can be omitted or substituted with English spinach, finely sliced silverbeet, kale or even cabbage. 3. This recipe is based on this Chickpea and Potato Curry (Chana Aloo Curry) which I shared a couple of years ago. It’s a Caribbean curry from Trinidad, but it tastes very similar to Indian curries. It is slightly modified from this Curry Channa and Aloo recipe from Immaculate Bites, a fantastic African/Caribbean food site. 4. Nutrition is for around 1 1/2 cups of curry, assuming this serves 6. Excludes rice (I often serve this without rice). Vegetable Curry recipe video! I use slightly different vegetables in this – more cauliflower and no zucchini. Reunited – and back to life as usual: this is how afternoon tea goes down every day. 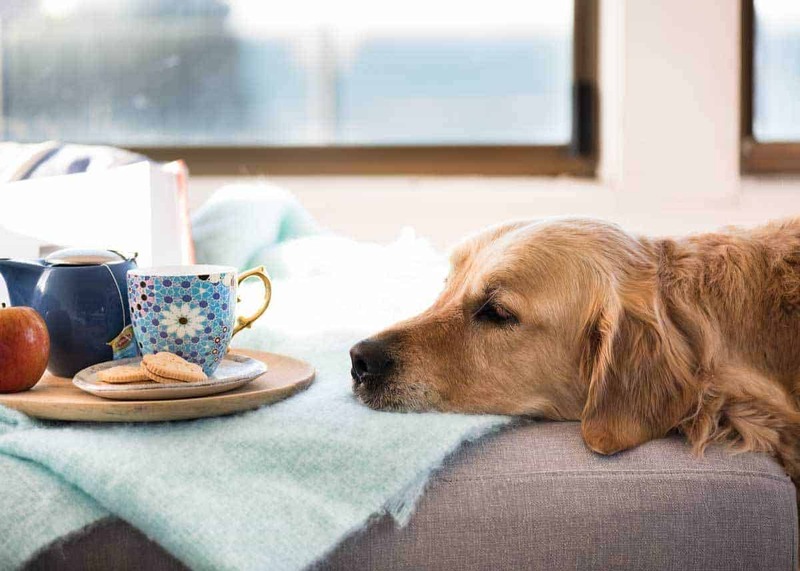 How can one enjoy tea when stinky dog breath is being breathed all over it?? 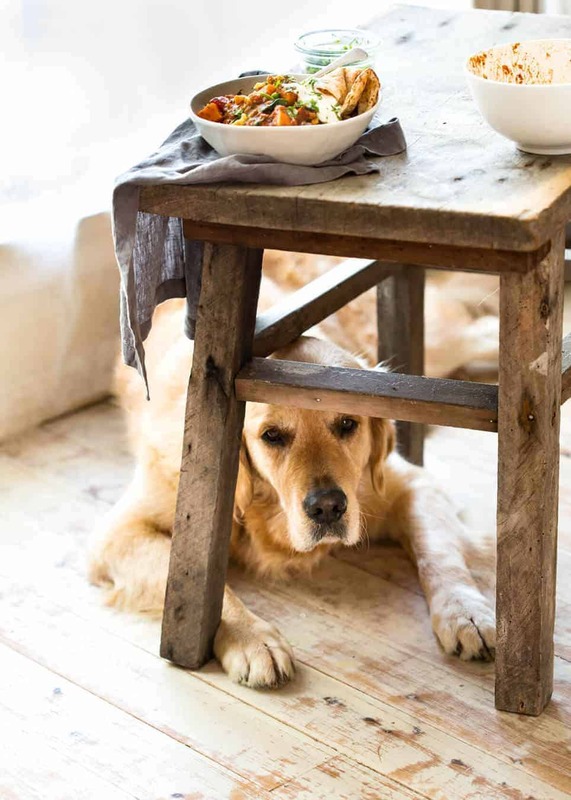 And of course, assuming his usual position while photographing today’s recipe…. Tried this recipe and although quite nice we found it far too wet even after blending 2 cupfulls of the mixture. Also far too herby, not curry like so will miss out herbs next time and blend 3 cup fulls of mixture to thicken more. Hi Stephen, sorry to hear you thought it was too thin and herby, you can always reduce the amount of herbs/spices if you prefer! That’s so great to hear Mary! Yes! And it makes a great freezer meal – I’m so glad you love it! Great Recipe! Everyone I’ve shared it with has loved it as well. Thanks! That’s awesome, thanks so much for the great feedback! Great recipe, I didn’t have any cayenne so i used some chilli instead. Turned out perfectly spicy! Just made this tonight. I was kind of spicy but my family love it… will definitely make it again. Can you use a crock pot to make this? I just cooked this and its brilliant absolutely loved it!! I did tone down the cayenne lol !! Delicious, just what we needed on a cold winters night. Left out the heat of the cayenne pepper and really enjoyed the favour of the herb and spices. This recipe is now my favourite vegetable curry. I am a real carnivore so,when my daughter asked for a vegetable dish, I thought “Ask Nagi.” Thanks. As usual, your recipes are easy to follow and delicious. 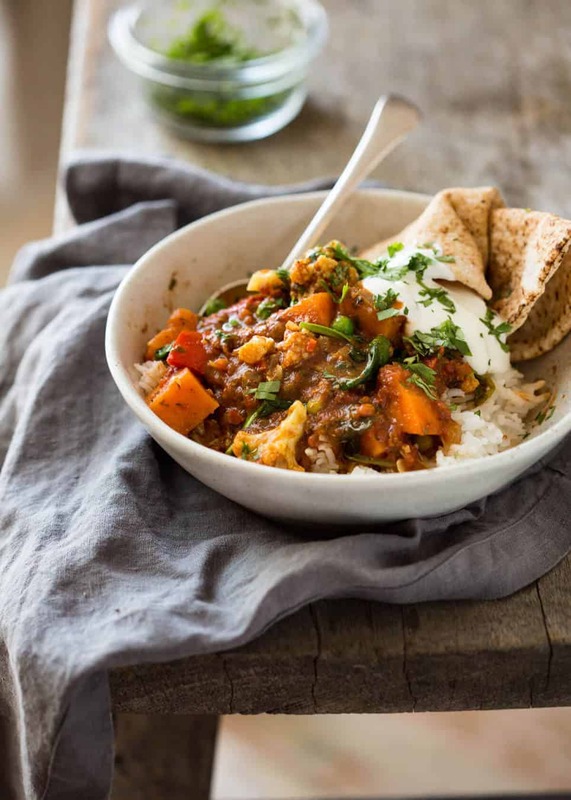 Nag, I’m so happy I stumbled on your site when looking for a good vegetable curry! I used a purple Japanese sweet potato, carrots, peas, edamame, aduki beans because it’s what I had on hand. I used the tomatos, garlic and onion and your spice mix, didn’t have coriander leaves which would have been even better. Absolutely delicious. Topped with yogurt and served over jasmine basmati rice. Makes a lot of food, will be even better today with flavors melding. Looking forward to your recipes, thanks! Just made this, wow spicy!but so nice. Think I may have over done the measurements as I’ve enough to feed about 10! Good thing is with no meat we will be eating this for the next two days. Thanks for all the lovely recipes on your website, it’s my go-to place when I want to cook ‘something different’ to get me out of my cooking rut. Ha ha, I have visions of Boeffie sprawled on the kitchen floor, her eyes following your every movement! I am hooked on this recipe blog. I’ve made one recipe every day since New Years Day when i made your lentil soup. Thank you!! Hi Nagi, This sounds yum looking forward to trying it 🙂 Just wondering would you have a vegetable broth you could recommend? We have previously bought pre made vege broths from Wollies and my husband and I both felt a bit crook after having it in our meals so wondering if there is one you could recommend.